Earn 750 Bonus Points when you buy 4 of the same Energy Drinks. Shop using your Speedy Rewards Points. Your Speedy Rewards card and a credit card all in one! Hiring the Best, Offering the Best in Benefits. Download our mobile app to get exclusive coupons, redeem points, and manage your account. Welcome to Speedway.com, owned and operated by Speedway. This Web Site Agreement (the “Agreement”) is between you and Speedway and its affiliates and subsidiaries (“Company”). You may contact Speedway at 500 Speedway Drive, Enon, Ohio 45323; 937-864-3000; Customer Service Section (email). Use of this Web site (the “Web Site”) signifies your agreement to the terms and conditions of use set forth below in the Agreement. (1) Agreement to Terms. You acknowledge that you have read the terms and conditions of use and that you accept the terms thereof. YOU AGREE TO READ THESE TERMS AND CONDITIONS OF USE CAREFULLY BEFORE USING THIS WEB SITE. If you do not agree to these terms and conditions of use, you may not access or otherwise use this Web Site. (2) Use of Information. Company may monitor your use of this Web Site, and may freely use and disclose any information and materials received from you or collected through your use of the Web Site for any lawful reason or purpose, consistent with the Privacy Statement posted on this Web Site. (3) Modification of Agreement. Company reserves the right, at its sole discretion, to change, modify, add or remove any portion of this Agreement, in whole or in part, at any time. Notification of changes in the Agreement will be posted on the Web Site. Use of the Web Site after such notice will be considered an agreement to be bound by any such changes. You should review this page from time to time to read any changes. (4) Copyright Protection and Use of Company Information or Web Site. The Web Site is protected by copyright as a collective work and/or compilation, pursuant to U.S. copyright laws, international conventions, and other copyright laws. The contents of the Web Site are only for your personal use. All materials contained on the Web Site are protected by copyright, and are owned or controlled by Company or the party credited as the provider of the Content. You will abide by any and all additional copyright notices, information, or restrictions contained in any Content on the Web Site. Company does, however, invite you to make a single copy of information published on the Web Site for your personal, non-commercial use provided that you maintain all copyright and other notices contained in such Content. Otherwise, copying or storing of any Content for other than personal, noncommercial use is expressly prohibited without the prior written permission from Company or the copyright holder identified in the individual Contents copyright notice. Company names, logos, and trademarks may not be otherwise used by you in any manner without the prior written consent of Company. (5) Right to Change Web Site. Company may change, suspend or discontinue any aspect of the Web Site at any time, including the price and availability of any product, Web Site feature, database, or Content. Company may also impose limits on certain features and services or restrict your access to parts or all of the Web Site without notice or liability. Company reserves the right, in its sole discretion, to refuse service or cancel orders. (6) Your Warranties to Company. You represent, warrant and covenant that: (a) you shall not upload, post or transmit to or distribute or otherwise publish through the Web Site any materials which (i) restrict or inhibit any other user from using and enjoying the Web Site, (ii) are unlawful, threatening, abusive, libelous, defamatory, obscene, vulgar, offensive, pornographic, profane, sexually explicit or indecent, (iii) constitute or encourage conduct that would constitute a criminal offense, give rise to civil liability or otherwise violate law, (iv) violate, plagiarize or infringe the rights of third parties including, without limitation, copyright, trademark, patent, rights of privacy or publicity or any other proprietary right, (v) contain a virus or other harmful component (vi) contain any information, software or other material of a commercial nature, (vii) contain advertising of any kind, or (viii) constitute or contain false or misleading indications of origin or statements of fact; (b) that you are at least eighteen (18) years old; and (c) that you shall not use, access, or modify this Web Site, any of its content or any of the information or data transmitted through the Web Site for any purpose or in any manner not expressly authorized by these Terms and Conditions of Use. Speedway reserves the right to pursue any and all civil and criminal remedies for any breach of the warranties contained herein. (7) Information on Children. Company does not seek to gather personal information from or about persons under the age of 18 through the Web Site and persons under the age of 18 are requested not to provide personal information to Company through the Web Site without the involvement of a parent or guardian. (8) Indemnification for Your Breach of Agreement. You hereby agree to indemnify, defend and hold Company, and all its officers, directors, owners, agents, employees, information providers, affiliates, licensors and licensees (collectively, the "Indemnified Parties') harmless from and against any and all liability and costs incurred by the Indemnified Parties in connection with any claim arising out of any breach by you of the Agreement or the foregoing representations, warranties and covenants, including, without limitation, attorneys fees and costs. You shall cooperate as fully as reasonably required in the defense of any claim. Company reserves the right, at its own expense, to assume the exclusive defense and control of any matter otherwise subject to indemnification by you and you shall not in any event settle any matter without the written consent of Company. The maximum liability collectively of the Indemnified Parties shall not exceed One Hundred Dollars ($100) for any damages of any nature, including gross negligence, arising in contract or tort or otherwise. (9) No Responsibility for Links. The Web Site contains links and pointers to other World Wide Web Internet sites, resources, and sponsors of the Web Site. Links to and from the Web Site to other third party sites, maintained by third parties, do not constitute an endorsement or representation of the accuracy by Company or any of its subsidiaries or affiliates of any third party resources, or their contents or the conditions respecting the use thereof. Such links do not constitute sponsorship, endorsement, adoption, or approval of such web sites or their contents by Company. You are responsible for determining the conditions of use and taking protective measures against viruses when accessing any linked sites. (10) User Postings. Company does not and cannot review all materials posted to the Web Site by users, and Company is not responsible for any such materials posted by users. However, Company reserves the right at all times to disclose any information as necessary to satisfy any law, regulation or government request, or to edit, refuse to post or to remove any information or materials, in whole or in part, that in Company's sole discretion are objectionable or in violation of this Agreement. (11) No Warranty as to Information. Company does not represent or endorse the accuracy, completeness or reliability of any description, price, statement, text, graphics, links or other information displayed or distributed through the Web Site, including those of its affiliates and subsidiaries (collectively “Web Site”). You acknowledge that any reliance upon any such statement, memorandum, or information shall be at your sole risk and responsibility. Company reserves the right, in its sole discretion, to correct any errors or omissions in any portion of the Web Site. (12) NO WARRANTY. THE WEB SITE, INCLUDING ALL CONTENT, SOFTWARE, FUNCTIONS, MATERIALS AND INFORMATION MADE AVAILABLE ON OR ACCESSED THROUGH THE COMPANY WEB SITE, IS PROVIDED "AS IS." TO THE FULLEST EXTENT PERMISSIBLE BY LAW, COMPANY AND ITS SUBSIDIARIES AND AFFILIATES MAKE NO REPRESENTATION OR WARRANTIES OF ANY KIND WHATSOEVER FOR THE CONTENT ON THE WEB SITE OR THE MATERIALS, INFORMATION AND FUNCTIONS MADE ACCESSIBLE BY THE SOFTWARE USED ON OR ACCESSED THROUGH THE COMPANY WEB SITE, FOR ANY PRODUCTS OR SERVICES OR HYPERTEXT LINKS TO THIRD PARTIES OR FOR ANY BREACH OF SECURITY ASSOCIATED WITH THE TRANSMISSION OF SENSITIVE INFORMATION THROUGH THE WEB SITE OR ANY LINKED SITE. FURTHER, COMPANY AND ITS SUBSIDIARIES AND AFFILIATES DISCLAIM ANY EXPRESS OR IMPLIED WARRANTIES, INCLUDING, WITHOUT LMTATION, NON-INFRINGEMENT, MERCHANTABILITY OR FITNESS FOR A PARTICULAR PURPOSE. COMPANY DOES NOT WARRANT THAT THE FUNCTIONS CONTAINED IN THE WEB SITE OR ANY MATERIALS OR CONTENT CONTAINED THEREIN WILL BE UNINTERRUPTED OR ERROR FREE, THAT DEFECTS WILL BE CORRECTED, OR THAT THE COMPANY WEB SITE OR THE SERVER THAT MAKES IT AVAILABLE IS FREE OF VIRUSES OR OTHER HARMFUL COMPONENTS. COMPANY ASSUMES NO RESPONSIBILITY, AND SHALL NOT BE LIABLE FOR ANY DAMAGES TO, OR VIRUSES THAT MAY INFECT, A VISITOR'S COMPUTER EQUIPMENT OR OTHER PROPERTY ON ACCOUNT OF A VISITOR'S ACCESS TO, USE OF, BROWSING IN, OR DOWNLOADING OF ANYTHING FROM, THE WEB SITE. COMPANY AND ITS SUBSIDIARIES AND AFFILIATES SHALL NOT BE LIABLE FOR THE USE OF THE WEB SITE, INCLUDING, WITHOUT LIMITATION, THE CONTENT AND ANY ERRORS CONTAINED THEREIN. (13) NO AWARD OF DAMAGES AGAINST COMPANY. IN NO EVENT SHALL COMPANY OR ANY OF ITS SUBSIDIARIES OR AFFILIATES BE LIABLE FOR ANY DIRECT, INDIRECT, SPECIAL, CONSEQUENTIAL OR OTHER DAMAGES ARISING OUT OF THE USE OF THIS WEB SITE OR ANY LINKED WEB SITE. THIS INCLUDES WITHOUT LIMITATION LOST PROFITS, BUSINESS INTERRUPTION, DAMAGE TO EQUIPMENT, COMPUTER PROGRAMS, OR INFORMATION SYSTEM, OR THE LOSS OF ANY INFORMATION OR DATA. (14) Use of Your Information. Except as provided otherwise in Company’s Privacy Statement posted on this Web Site, by posting messages, uploading files, inputting data or engaging in any other form of communication (individually or collectively "Communications') to the Web Site, you hereby grant to Company a perpetual, worldwide, irrevocable, unrestricted, non-exclusive, royalty free license to use, copy, license, sublicense, adapt, distribute, display, publicly perform, reproduce, transmit, modify, edit and otherwise exploit such Communications, in all media now known or hereafter developed. You hereby waive all rights to any claim against Company for any alleged or actual infringements of any proprietary rights, rights of privacy and publicity, moral rights, and rights of attribution in connection with such Communications. Any visitor to the Web Site transmitting or providing information to Company via E-mail or otherwise agrees that Company has unlimited rights to such information and that Company may treat such information as non-confidential and non-proprietary and may use such information in any way Company chooses without compensation or acknowledgement of its source, except as otherwise restricted by applicable law. (15) No Confidential Information. Except as provided otherwise in Company’s Privacy Statement with respect to certain personal data and financial information, you acknowledge that transmission to and from this Web Site is not confidential and your Communications may be read or intercepted by others. You acknowledge that by submitting Communications to Company, no confidential, fiduciary, contractually implied or other relationship is created between you and Company other than pursuant to this Agreement. (16) GOVERNING LAW. THIS AGREEMENT SHALL BE GOVERNED BY AND CONSTRUED IN ACCORDANCE WITH THE LAWS OF THE STATE OF OHIO, WITHOUT REGARD TO CONFLICTS OF LAWS PROVISIONS. WITHOUT REGARD TO CONFLICTS OF LAWS PROVISIONS. SOLE AND EXCLUSIVE JURISDICTION FOR ANY ACTION OR PROCEEDING ARISING OUT OF OR RELATED TO THIS AGREEMENT SHALL BE AN APPROPRIATE STATE OR FEDERAL COURT LOCATED IN THE STATE OF OHIO. VENUE SHALL BE LIMITED TO THE COUNTIES OF MONTGOMERY, GREENE OR CLARK, STATE OF OHIO. (17) Entire Agreement. This Agreement and the Privacy Statement constitutes the entire agreement between Company and you with respect to your use of the Web Site. Any cause of action you may have with respect to your use of the Web Site must be commenced within one (1) year after the claim or cause of action arises. If for any reason a court of competent jurisdiction finds any provision of the Agreement, or portion thereof, to be unenforceable, that provision shall be enforced to the maximum extent permissible so as to effect the intent of the Agreement, and the remainder of this Agreement shall continue in full force and effect. Company disclaims any and all responsibility for content contained in any third party materials provided through links from the Web Site. Use of paragraph headings is for information purposes and do not expand or limit the terms of the paragraphs. (18) Dispute Resolution. Except for the right of either party to apply to a court of competent jurisdiction for injunctive relief, any controversy or claim arising out of or relating to this Agreement, other than as to ownership or title to intellectual property rights in the proprietary information of Company, shall be settled by arbitration in Springfield, Ohio, in accordance with the Commercial Arbitration Rules of the American Arbitration Association, and judgment upon the award rendered by the arbitrators may be entered in any court having jurisdiction thereof. Arbitration shall be conducted by a panel of three members, Company and you each selecting one member and the third member, who shall be chairperson, selected by agreement between the other two members. The chairperson shall be an attorney-at-law, and the other members shall have a background or training in computer law, computer science, or marketing of computer products. The arbitrators shall have the authority to grant injunctive relief in a form substantially similar to that which would otherwise be granted by a court of law. If an arbitrator lawfully awards damages to you, such damages shall not exceed one hundred dollars ($100). (19) See also Company’s Privacy Statement. Welcome to Speedy Rewards, owned and operated by Speedway LLC. 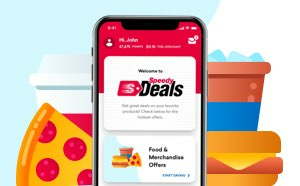 These Speedy Rewards terms and conditions form the agreement (the “Agreement”) between you (“You”) and Speedway LLC and its affiliates and subsidiaries (“Company”). You may contact Speedway LLC at 500 Speedway Drive, Enon, Ohio 45323; 937-864-3000. (1) Agreement to Terms. YOU AGREE TO READ THESE TERMS AND CONDITIONS CAREFULLY BEFORE USING THE SPEEDY REWARDS PROGRAM. If you do not agree to these terms and conditions, you may not participate in the Speedy Rewards program. Use of the Speedy Rewards program signifies your agreement to the terms and conditions of use set forth below. (2) Modification of Agreement. Company reserves the right, at its sole discretion, to change, modify, add or remove any portion of this Agreement, in whole or in part, at any time. Notification of changes in the Agreement will be posted on www.Speedway.com (the “Website”). Use of the Speedy Rewards program after such notice will be considered your agreement to be bound by any such changes. (3) Copyright Protection and Use of Company Information. The Speedy Rewards program is protected by copyright as a collective work and/or compilation, pursuant to U.S. copyright laws, international conventions and other copyright laws. Company names, logos and trademarks may not be used by you in any manner without the prior written consent of Company. (4) Minimum Age Requirement. You must be at least 13 years old to apply for and hold a Speedy Rewards account. (5) Company’s Rights in Speedy Rewards Program. Company may change, suspend or discontinue any aspect of the Speedy Rewards program at any time, including but not limited to rewards and point accrual/redemption methods. Company may also impose limits on membership eligibility, certain features and services or restrict your access to parts or all of the Speedy Rewards program or the Website without notice or liability. Company reserves the right, in its sole discretion, to refuse service, cancel membership, suspend or terminate an account. (6) Indemnification for Your Breach of Agreement. You hereby agree to indemnify, defend and hold Company, and all its officers, directors, owners, agents, employees, information providers, licensors and licensees (collectively, the “Indemnified Parties”) harmless from and against any and all liabilities and costs incurred by the Indemnified Parties in connection with any claim arising out of any breach by You of the Agreement or the foregoing representations, warranties and covenants, including, without limitation, attorneys fees and costs. You shall cooperate as fully as reasonably required in the defense of any claim. Company reserves the right, at its own expense, to assume the exclusive defense and control of any matter otherwise subject to indemnification by You and You shall not in any event settle any matter without the written consent of Company. (7) NO WARRANTY. 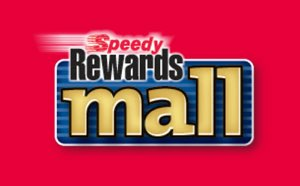 THE SPEEDY REWARDS PROGRAM, INCLUDING ALL CONTENT, FUNCTIONS, MATERIALS AND INFORMATION MADE AVAILABLE TO YOU OR ACCESSED BY YOU THROUGH THE WEBSITE, IS PROVIDED "AS IS." TO THE FULLEST EXTENT PERMISSIBLE BY LAW, COMPANY MAKES NO REPRESENTATION OR WARRANTIES OF ANY KIND WHATSOEVER FOR THE CONTENT OF THE SPEEDY REWARDS PROGRAM, THE MATERIALS, INFORMATION AND FUNCTIONS MADE ACCESSIBLE THROUGH THE WEBSITE, OR FOR THE PRODUCTS AND/OR SERVICES AWARDED OR REDEEMED THROUGH THE PROGRAM. FURTHER, COMPANY DISCLAIMS ANY EXPRESS OR IMPLIED WARRANTIES, INCLUDING, WITHOUT LIMITATION, NON-INFRINGEMENT, MERCHANTABILITY OR FITNESS FOR A PARTICULAR PURPOSE. COMPANY ASSUMES NO RESPONSIBILITY, AND SHALL NOT BE LIABLE FOR ANY DAMAGES BY USE OF THE SPEEDY REWARDS PROGRAM OR THE WEBSITE. COMPANY AND ITS SUBSIDIARIES AND AFFILIATES SHALL NOT BE LIABLE FOR THE USE OF THE SPEEDY REWARDS PROGRAM, INCLUDING, WITHOUT LIMITATION, THE WEBSITE AND ANY ERRORS CONTAINED THEREIN. COMPANY SHALL NOT BE LIABLE FOR ANY FAILURE OF THE SPEEDY REWARDS PROGRAM, INCLUDING THE WEBSITE, WHICH RESULTS FROM ACTS OR EVENTS BEYOND THE COMPANY’S REASONABLE CONTROL. (8) LIMITATION OF COMPANY’S LIABILITY AND DAMAGES. IN NO EVENT SHALL COMPANY BE LIABLE FOR ANY LOSS ARISING OUT FROM LOST OR STOLEN SPEEDY REWARDS CARDS, NOR FOR ANY DIRECT, INDIRECT, SPECIAL, CONSEQUENTIAL OR OTHER DAMAGES ARISING OUT OF THE USE OF THE SPEEDY REWARDS PROGRAM OR THE WEBSITE. THIS INCLUDES, WITHOUT LIMITATION, LOST PROFITS, LOST POINTS, BUSINESS INTERRUPTION, DAMAGE TO EQUIPMENT, COMPUTER SYSTEMS OR PROGRAMS, OR ANY INFORMATION SYSTEM, OR THE LOSS OF ANY INFORMATION OR DATA. THE MAXIMUM LIABILITY COLLECTIVELY OF THE COMPANY SHALL NOT EXCEED ONE HUNDRED DOLLARS ($100) FOR ANY DAMAGES OF ANY NATURE, INCLUDING GROSS NEGLIGENCE, ARISING IN CONTRACT, TORT OR OTHERWISE. (9) Expiration and Forfeiture of Points. Points earned on a SPEEDY REWARDS Membership Card expire after nine (9) months of account inactivity. (10) SPEEDWAY® CREDIT CARD REWARDS PROGRAM. Customers with a Speedway Credit Card (“Speedway Card”) can earn additional Speedy Rewards Points through the Speedway Credit Card Rewards Program (the “Credit Card Rewards Program”). First Bankcard®, a division of First National Bank of Omaha (“First Bankcard”) is the issuer of the Speedway Card and the sponsor of the Credit Card Rewards Program. Visit https://www.firstbankcard.com/speedway/rewardsterms/rewards.pdf to refer to the Credit Card Rewards Program Terms and Conditions. (11) Entire Agreement. These terms and conditions and the Privacy Statement constitute the entire agreement between Company and You with respect to your use of the Speedy Rewards program. Any cause of action You may have with respect to your use of the Speedy Rewards program must be commenced within one (1) year after the claim or cause of action arises. If for any reason a court of competent jurisdiction finds any provision of the Agreement, or portion thereof, to be unenforceable, that provision shall be enforced to the maximum extent permissible so as to effect the intent of the Agreement, and the remainder of this Agreement shall continue in full force and effect. (12) See also Company’s Privacy Statement, incorporated herein by reference. (1) Agreement to Terms. You acknowledge that you have read the Terms and Conditions of Use (“Terms”) and that you accept the Terms thereof. YOU AGREE TO READ THESE TERMS AND CONDITIONS OF USE CAREFULLY BEFORE USING THE APPLICATION. If you do not agree to these Terms and Conditions of Use, you should uninstall the Application immediately. (3) Modification of Agreement. Speedway reserves the right, at its sole discretion, to change, modify, add or remove any portion of the Application and these Terms, in whole or in part, at any time. Use of the Application after such changes will be considered an agreement to be bound by any such changes. You should review these Terms from time to time to read any changes. (4) Copyright Protection and Use of Speedway Information. The Application is protected by copyright as a collective work and/or compilation, pursuant to U.S. copyright laws, international conventions, and other copyright laws. The contents of the Application are only for your personal use. All content or other materials contained in the Application are protected by copyright, and are owned or controlled by Speedway or the party credited as the provider of the content. You will abide by any and all additional copyright notices, information, or restrictions contained in any content viewed on or through the Application. Copying or storing of any content for other than personal, noncommercial use is expressly prohibited without the prior written permission from Speedway or the copyright holder identified in the individual contents copyright notice. Speedway names, logos, and trademarks may not be otherwise used by you in any manner without the prior written consent of Speedway. You do not acquire ownership rights to any content or other materials viewed on or through the Application. The posting of information or materials on the Application does not constitute a waiver of any rights therein. You may not (and you may not permit anyone else to) copy, modify, create a derivative work of, reverse engineer, decompile or otherwise attempt to extract any source code of the Application or any part thereof. (5) User License. Subject to these Terms, Speedway grants you a personal, non-exclusive, non-transferable, limited and revocable license to use the Application for personal use only on a mobile device owned or controlled by you. Any use of the Application in any other manner, including, without limitation, resale, transfer, modification or distribution of the Application or text, pictures, music, barcodes, video, date, hyperlinks, displays and other content associated with the Application is prohibited. These Terms and this User License also govern any updates to, or supplements or replacements for, this Application unless separate terms accompany such updates, supplements or replacements, in which case the separate terms will apply. (6) Prohibited Use of the Application. You agree that (a) you shall not upload, post or transmit to or distribute or otherwise publish through the Application any content or materials which (i) harasses, abuses, or stalks any other user; (ii) are unlawful, threatening, abusive, libelous, defamatory, obscene, vulgar, offensive, pornographic, profane, sexually explicit or indecent; (iii) constitute or encourage conduct that would constitute a criminal offense, give rise to civil liability or otherwise violate law; (iv) violate, plagiarize or infringe the rights of third parties including, without limitation, copyright, trademark, patent, rights of privacy or publicity or any other proprietary right; (v) contain a virus or other harmful component; (vi) contain any information, software or other material of a commercial nature; (vii) contain advertising of any kind; or (viii) constitute or contain false or misleading indications of origin or statements of fact; (b) that you are at least thirteen (13) years old, and if you are 13 or older, but under the age of eighteen (18), that you have shared these Terms and Conditions with your parent or guardian and obtained their permission to use or access this Application; and (c) that you shall not use or access this Application, any of its content or any of the information or materials transmitted through the Application for any purpose or in any manner not expressly authorized by these Terms and Conditions of Use. Speedway reserves the right to pursue any and all civil and criminal remedies for any breach of this agreement. (7) Information on Children. Speedway does not seek to gather personal information from or about persons under the age of 18 through the Application and persons under the age of 18 are requested not to provide personal information to Speedway through the Application without the involvement of a parent or guardian. (8) Indemnification for Your Breach of Agreement. You hereby agree to indemnify, defend and hold Speedway, and all its officers, directors, owners, agents, employees, information providers, affiliates, licensors and licensees (collectively, the "Indemnified Parties') harmless from and against any and all liability and costs incurred by the Indemnified Parties in connection with any claim arising out of any breach by you of these Terms, including, without limitation, attorneys fees and costs. You shall cooperate as fully as reasonably required in the defense of any claim. Speedway reserves the right, at its own expense, to assume the exclusive defense and control of any matter otherwise subject to indemnification by you and you shall not in any event settle any matter without the written consent of Speedway. (10) User Postings. Speedway does not and cannot review all materials posted to the Application by users, and Speedway is not responsible for any such materials posted by users. However, Speedway reserves the right at all times to disclose any information as necessary to satisfy any law, regulation or government request, or to edit, refuse to post or to remove any information or materials, in whole or in part, that in Speedway's sole discretion are objectionable or in violation of these Terms. (11) No Warranty as to Information. The Application may contain general information related to Speedway locations, daily fuel prices available at Speedway locations, information related to the Speedy Rewards program, links to and information from the Speedway website and social media profiles. Speedway makes no warranties, representations or guarantees that such information is accurate or that any service or product referenced in the material found in the Application will be available at a specific time or at a certain Speedway location. Speedway does not represent or endorse the accuracy, completeness or reliability of any description, price, statement, text, graphics, links or other information displayed or found through the Application, including those of its affiliates and subsidiaries. You acknowledge that any reliance upon any such information shall be at your sole risk and responsibility. Speedway reserves the right, in its sole discretion, to correct any errors or omissions in any portion of the Application. (12) NO WARRANTY. THE APPLICATION, INCLUDING ALL CONTENT, SOFTWARE, FUNCTIONS, MATERIALS AND INFORMATION MADE AVAILABLE ON OR ACCESSED THROUGH THE APPLICATION, IS PROVIDED "AS IS" AND “AS AVAILABLE”. TO THE FULLEST EXTENT PERMISSIBLE BY LAW, SPEEDWAY, ITS SUBSIDIARIES AND AFFILIATES MAKE NO REPRESENTATION OR WARRANTIES OF ANY KIND, EXPRESS OR IMPLIED FOR THE OPERATION OF THE APPLICATION, THE CONTENT ON THE APPLICATION OR THE MATERIALS, INFORMATION AND FUNCTIONS MADE ACCESSIBLE BY THE APPLICATION, FOR ANY PRODUCTS OR SERVICES OR LINKS TO THIRD PARTIES OR FOR ANY BREACH OF SECURITY ASSOCIATED WITH THE TRANSMISSION OF ANY INFORMATION THROUGH THE APPLICATION OR ANY LINKED SITE. FURTHER, SPEEDWAY, ITS SUBSIDIARIES AND AFFILIATES DISCLAIM ANY EXPRESS OR IMPLIED WARRANTIES, INCLUDING, WITHOUT LIMITATION, NON-INFRINGEMENT, MERCHANTABILITY OR FITNESS FOR A PARTICULAR PURPOSE. SPEEDWAY DOES NOT WARRANT THAT THE FUNCTIONS CONTAINED IN THE APPLICATION OR ANY MATERIALS OR CONTENT CONTAINED THEREIN WILL BE UNINTERRUPTED OR ERROR FREE, THAT DEFECTS WILL BE CORRECTED, OR THAT THE APPLICATION IS FREE OF VIRUSES OR OTHER HARMFUL COMPONENTS. SPEEDWAY ASSUMES NO RESPONSIBILITY, AND SHALL NOT BE LIABLE FOR ANY DAMAGES TO A USER’S MOBILE DEVICE OR OTHER PROPERTY ON ACCOUNT OF A USER'S ACCESS TO, USE OF, OR DOWNLOADING OF ANYTHING FROM, THE APPLICATION. SPEEDWAY, ITS SUBSIDIARIES AND AFFILIATES SHALL NOT BE LIABLE FOR THE USE OF THE APPLICATION, INCLUDING, WITHOUT LIMITATION, THE CONTENT AND ANY ERRORS CONTAINED THEREIN. (13) NO AWARD OF DAMAGES AGAINST COMPANY. IN NO EVENT SHALL SPEEDWAY, ITS SUBSIDIARIES OR AFFILIATES BE LIABLE FOR ANY DIRECT, INDIRECT, SPECIAL, CONSEQUENTIAL OR OTHER DAMAGES ARISING OUT OF THE USE OF THIS APPLICATION OR ANY LINKED WEB SITE OR APPLICATION. THIS INCLUDES WITHOUT LIMITATION LOST PROFITS, BUSINESS INTERRUPTION, DAMAGE TO EQUIPMENT, MOBILE DEVICES, COMPUTER PROGRAMS OR INFORMATION SYSTEMS, OR THE LOSS OF ANY INFORMATION OR DATA. In no event shall Speedway’s total liability to you for all damages (other than as may be required by applicable law in cases involving personal injury) exceed the amount of Fifty Dollars ($50.00). The foregoing limitations will apply even if the above stated remedy fails of its essential purpose. (14) Use of Your Information. Except as provided otherwise in Speedway’s Privacy Statement posted on Speedway’s web site, by posting messages, or engaging in any other form of communication on or through the Application, you hereby grant to Speedway a perpetual, worldwide, irrevocable, unrestricted, non-exclusive, royalty free license to use, copy, license, sublicense, adapt, distribute, display, publicly perform, reproduce, transmit, modify, edit and otherwise exploit such communications, in all media now known or hereafter developed. You hereby waive all rights to any claim against Speedway for any alleged or actual infringements of any proprietary rights, rights of privacy and publicity, moral rights, and rights of attribution in connection with such communications. Any user of the Application transmitting or providing information to Speedway via message or post otherwise agrees that Speedway has unlimited rights to such information and that Speedway may treat such information as non-confidential and non-proprietary and may use such information in any way Speedway chooses without compensation or acknowledgement of its source, except as otherwise restricted by applicable law. (15) No Confidential Information. Except as provided otherwise in Speedway’s Privacy Statement with respect to certain personal data and financial information, you acknowledge that transmission to and from this Application is not confidential and your communications may be read or intercepted by others. You acknowledge that, by submitting communications to Speedway via the Application, no confidential, fiduciary, contractually implied or other relationship is created between you and Speedway other than pursuant to these Terms. (16) GOVERNING LAW. THIS AGREEMENT SHALL BE GOVERNED BY AND CONSTRUED IN ACCORDANCE WITH THE LAWS OF THE STATE OF OHIO, WITHOUT REGARD TO CONFLICTS OF LAWS PROVISIONS. SOLE AND EXCLUSIVE JURISDICTION FOR ANY ACTION OR PROCEEDING ARISING OUT OF OR RELATED TO THIS AGREEMENT SHALL BE AN APPROPRIATE STATE OR FEDERAL COURT LOCATED IN THE STATE OF OHIO. VENUE SHALL BE LIMITED TO THE COUNTIES OF MONTGOMERY, GREENE OR CLARK, STATE OF OHIO. (17) Entire Agreement. These Terms constitute the entire agreement between Speedway and you with respect to your use of the Application. Any cause of action you may have with respect to your use of the Application must be commenced within one (1) year after the claim or cause of action arises. If for any reason a court of competent jurisdiction finds any provision of these Terms, or portion thereof, to be unenforceable, that provision shall be enforced to the maximum extent permissible so as to effect the intent of the agreement, and the remainder of this agreement shall continue in full force and effect. Speedway disclaims any and all responsibility for content contained in any third party materials provided through links from the Application. Use of paragraph headings is for information purposes and do not expand or limit the terms of the paragraphs. (18) Dispute Resolution. Except for the right of either party to apply to a court of competent jurisdiction for injunctive relief, any controversy or claim arising out of or relating to these terms and conditions, other than as to ownership or title to intellectual property rights in the proprietary information of Speedway, shall be settled by arbitration in Springfield, Ohio, in accordance with the Commercial Arbitration Rules of the American Arbitration Association, and judgment upon the award rendered by the arbitrators may be entered in any court having jurisdiction thereof. Arbitration shall be conducted by a panel of three members, Speedway and you each selecting one member and the third member, who shall be chairperson, selected by agreement between the other two members. The chairperson shall be an attorney-at-law, and the other members shall have a background or training in computer law, computer science, or marketing of computer products. The arbitrators shall have the authority to grant injunctive relief in a form substantially similar to that which would otherwise be granted by a court of law. If an arbitrator lawfully awards damages to you, such damages shall not exceed One Hundred Dollars ($100). You will receive Speedy Rewards points from merchants based on the net price of eligible items purchased, excluding taxes, shipping, and handling. In general, Speedy Reward points will not be earned for any portion of your purchase that you pay for with store credit, gift certificates, or other non-cash payments. 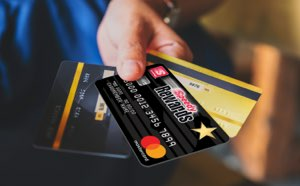 Any purchases made with other companies displayed on a merchant's site (regardless of whether or not they also appear on the Speedy Rewards Online Shopping Mall) will not earn you Speedy Rewards points unless you navigate to those merchants directly from the Speedy Rewards Online Shopping Mall site. Purchases must be completed online. You will not receive any Speedy Rewards points for any purchase charged at a merchant’s store location or by telephone. While Speedway and our partners work hard to properly track and credit all eligible online purchases, due to occasional miscommunications between your internet browser, the merchant's web site and our system, we are not always able to do so. Please contact Speedy Rewards Customer Service at 1-800-643-1948 if you believe you have made an online purchase that has not been posted to your account after 45 days from when you received the items you purchased. In the event that you return the purchased merchandise for any reason, any Speedy Rewards points you originally received will be subtracted from your account. Get free stuff by redeeming your points.